The Laguna de Santa Rosa (Laguna) watershed is an ecologically and economically important area of Northern California. In addition to having the largest freshwater wetlands complex on the northern California coast, the Laguna is also the home to a diverse assemblage of over 200 species, including several state and federally endangered plants and animals, and has recently been recognized as a Wetland of International Importance by the Ramsar Convention on Wetlands. The Laguna is the largest tributary of the Russian River, draining approximately 254 square miles through approximately 435 stream miles. The watershed contains a diversity of habitat including creeks, open water, perennial marshes, seasonal wetlands, riparian forests, oak woodlands, and grasslands. The Laguna is home to the City of Santa Rosa, the largest city in California’s North Coast Region, and the 12th largest metropolitan area in California. 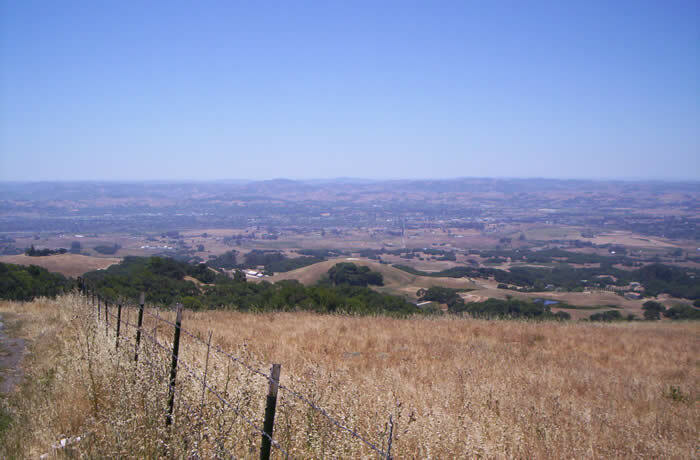 Though the watershed makes up only 16% of Sonoma County’s land mass, it is home to over half the county’s population, containing all or part of the cities of Windsor, Santa Rosa, Rohnert Park, Cotati, Sebastopol, and the community of Forestville. In addition to these urban areas, the Laguna watershed contains over 70 square miles (over one quarter of the watershed’s area) of important farmland, as designated by the California Department of Conservation. Due to its long history of settlement, particularly in the last two hundred fifty years, the Laguna has experienced significant changes to its hydrology, geomorphology, flora, and fauna, especially in areas of intensive land use. The Laguna de Santa Rosa once consisted of vast oak woodlands, riparian forests, lakes and perennial and seasonal freshwater wetlands. Herds of elk and pronghorn antelope were numerous, as well as mountain lions and the grizzly bears that inspired our state flag. The Laguna also supported many different species of birds, including the now extinct Yellow-Billed Cuckoo. Native American remains in the Laguna have been dated as far back as 10,000 years ago. As nomadic hunter gatherers, the indigenous peoples of the Laguna which included the Pomo, Wappo, and Miwok, lived off of acorns, roots, seeds, berries, fish, waterfowl, and a variety of game animals. They used native vegetation like tule to make rope, shelter, and canoes, while using other plants for food, clothing, dyes and medicine. In 1833, the first Mexican land grant was established which initiated the beginning of ranching and farming in the area. Settlers in the late 1800s were encouraged by the state to “reclaim” the farmable land that lay under the Laguna’s marshes, lakes, and wetlands. In the decades that followed, early settlers began draining and filling wetlands and clearing oak woodlands to make way for grain, row crops, hops, and orchards. Hunters were also very active at this time in the wildlife-rich Laguna as the demand for food increased from a rapidly growing San Francisco. A lack of hunting limit laws during this period led to massive over hunting in the Laguna (in 1892, a single market hunter killed 6,200 ducks). Agricultural use of the land intensified during the 1900s, as did residential and commercial development in the upper watershed. In the 1960s and 70s, miles of the Laguna were channelized for flood control and much of the riparian vegetation was removed. By 1990, 92% of the Laguna’s riparian forest was gone. While the Laguna de Santa Rosa hydrology and floodplain has changed dramatically from the past, flooding is still a common occurrence in the area. The Sonoma County Water Agency plays a large role in water resource and flood management . The agency is also leading the development of a Groundwater Management Plan and projects designed to recharge the groundwater aquifer using floodwaters. Sotoyome is a member of both the Santa Rosa Plain Groundwater Advisory Panel and the Technical Advisory Group. The RCD has worked with many agricultural producers in the Laguna to enhance their farming operations and protect soil and water resources. A past and current focus of the RCD’s work in the Laguna has been nutrient management on dairies. Since the mid-1990’s, the RCD has worked with local dairy producers to install gutters to divert clean water, fencing for beneficial livestock distribution, manure management facilities and more. Recent grant funding has allowed the RCD to assist dairies with compliance with the upcoming North Coast Dairy Waiver and Waste Discharge Requirements, and to undertake another round of nutrient management planning and implementation. The RCD has worked with many other livestock facilities including equine or horse, sheep, pigs, goats and chicken facilities to develop LandSmart plans to protect and improve water quality and achieve the landowners’ property management goals. Over 1,800 acres of livestock property have been assessed in this watershed. “Slow it, Spread It, Sink It, Store It!” practices are implemented with landowners throughout the watershed. These practices can help to protect and replenish groundwater resources, reduce erosion and pollution, prevent flooding and increase water conservation and stormwater management. The RCD is closely involved in a statewide groundwater monitoring effort called the California Statewide Groundwater Elevation Monitoring (CASGEM) program. This program was created by SBx7 6 and established for the first time a statewide program to collect groundwater elevations, facilitate collaboration between local monitoring entities and the Department of Water Resources, and to report this information to the public. The Sonoma County Water Agency (SCWA) and the County Permit Resource Management Department have assumed responsibility for collecting these data in the basins throughout Sonoma County. The RCD is in the process of finalizing a contract with the Water Agency (as of Summer 2016) to conduct outreach in the Santa Rosa Plain groundwater basin to gain landowner participation in the CASGEM program and then to collect groundwater elevation data for these various wells covering the basin. Groundwater data are collected on local landowner wells twice a year in the various basins and reported back to the Sonoma County Water Agency and the Department of Water Resources. The RCD is currently conducting groundwater elevation monitoring for the local residents that are in a two mile radius of the new Graton Rancheria Casino and Hotel Resort in Rohnert Park. The RCD was hired by the Federated Indians of Graton Rancheria, upon recommendation from the County of Sonoma and the Sonoma County Water Agency, to create a voluntary groundwater monitoring program and collect baseline data for the residents that could potentially be affected by drawdown of the water table from the new Casino and Hotel’s water use. Sonoma RCD is an active member agency of the Santa Rosa Plain Groundwater Sustainability Agency (GSA). 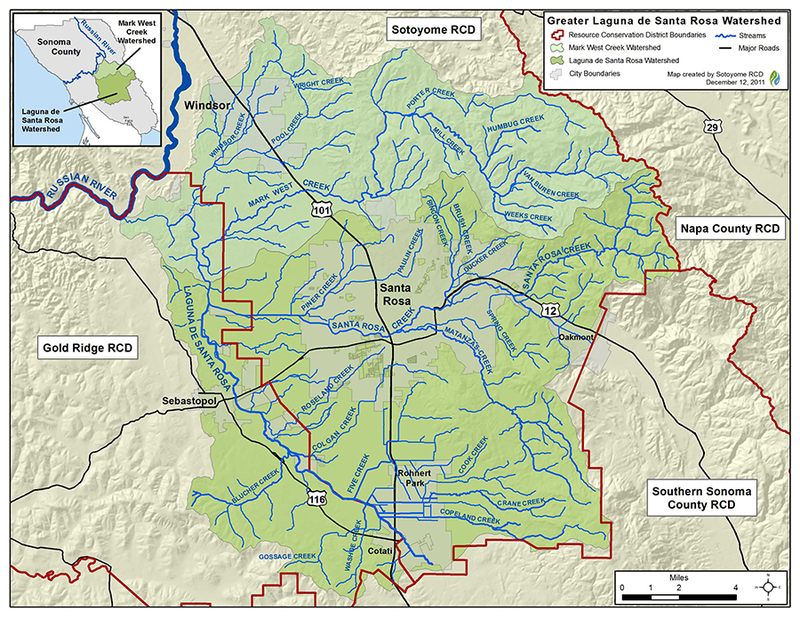 In 2012-2015, in collaboration with Gold Ridge RCD, the Sonoma RCD led the Water Quality Credit Trading the Laguna de Santa Rosa project, an innovative effort that brought together diverse stakeholders to develop a water quality market structure to achieve local water quality goals and serve as a model for the State of California. Dairy Water Quality Improvement Projects: In collaboration with Gold Ridge RCD, the RCD has worked with many dairy producers to implement projects and practices to reduce nutrient loading into the Laguna de Santa Rosa Watershed. Projects included nutrient management evaluation, clean water diversions, irrigation system improvements, manure management improvements, soil amending and fencing projects. Read the Water Quality Trading Framework for the Laguna de Santa Rosa Watershed, California here. Habitat Enhancement: With the participation of riparian landowners, the RCD has ongoing projects to enhance riparian habitat and remove invasive species in the Laguna de Santa Rosa and its tributaries. LandSmart Workshop series for agriculturalists and professionals are held as needed by the community. FARMS Leadership Program field days are held annually on private agricultural properties within the watershed. TEAM elementary youth program field trip site located within this watershed serving fourth graders throughout Sonoma County. For more information about the Laguna de Santa Rosa Watershed, please contact Valerie Minton at 707.569.1448 ext 102 or vminton@sonomarcd.org.